Good nutrition is important for optimal health. We know this. And when we’re speaking about our children, optimal health is directly linked to growth. A recent study from the UK suggests that we take the link one step further and say that good nutrition in children is tied to optimal brain growth. We nurse our babies because it builds their immune systems or we don’t nurse because we know that if we don’t enjoy it, those feelings will be passed on to the child. We play Mozart to them in the creche. We read story upon story to multiply and fire their synapses in a way that will create an amazing network of brain matter so sharp and abundant that they can choose their paths in life and succeed in every direction. We hover and we helicopter – both great topics for a post on another day. So why not begin by feeding them well and what words would convince those not doing so, that it is critically important? The fact is that the brain grows at its fastest rate during the first three years of life. According to the study of thousands of British children, a diet high in processed foods, sugar and fat may have the effect of lowering IQ. The report says that eating habits among three year olds shape brain performance as they get older. A predominantly processed-food diet at age three is directly associated with a lower IQ at age eight and a half. Meanwhile, the Journal of Epidemiology and Community Health reports that food full of vitamins and nutrients helps boost mental performance as the toddlers get older. Being a data-driven person, what I find startling is that for every one-point increase in the study’s dietary pattern score – a record of processed fat intake – there is a corresponding 1.67-point fall in IQ. I only have to google terms like low IQ+prison to learn what the alternative brings. The study goes on to speculate that good nutrition can actually increase IQ. So readers, we face yet another story where better knowledge about nutrition presented in a compelling manner might alter the course of a society. What is a compelling manner? 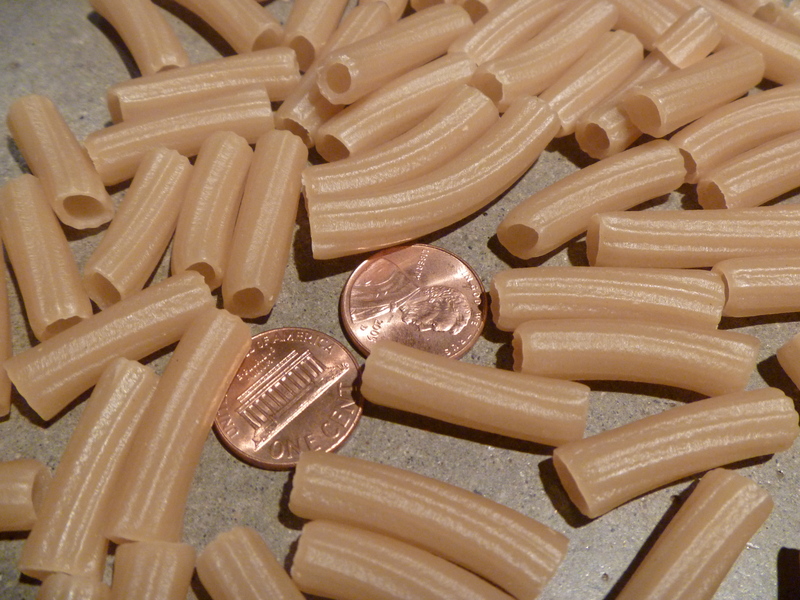 Cook pasta in salted water until al dente. Meanwhile, heat the olive oil. Saute the garlic and green onions until soft. Add the chard and radish and continue cooking until the radish is softened but still crunchy. Add salt, pepper and red pepper flakes to taste. I even throw in some red spaghetti sauce from a jar and a bit of sausage for my husband. Wild salmon would also be good. Oooh that would be great. I am reading the book Switch with the hopes that it will give me some additional compelling ways to reach people. Red chard will work great! I am still reading Switch but I was just telling a friend about it at lunch today. Interesting that they give so many examples of change surrounding food. The AMA should inform pediatricians about these studies and encourage hospitals to hand out one page dietary guidelines before mom and baby head home. Great recipe. I ate brain food pasta yesterday ~ well, actually, lo mein (with onions, garlic, ginger, carrots, celery, broccoli, spinach). YUMMY. That’s brainfood in my book Nancy. Hospitals are a good idea. Wonderful. I’m off to make a brain food curry now. All of the above and some spices with attitude…. Yum. Turmeric is another spice with purpose. What a fantastic POV! I bet no one has ever presented the argument for good nutrition over bad in this fashion. They always talk about bad foods with regards to weight or health issues. Brain function is sooooo important! You’re right – they do talk about bad food with weight and health as a backdrop. I wonder if talking about it this way can make a difference. This is another reason why early childhood programs (like Headstart) are important for low-income families. They include meal programs, which provides the children with at least one balanced meal per day. Plus they conduct nutrition assessments and consult with parents on how to provide balanced meals to their children. I did not know that headstart did that. I hope the meal they get is healthy. I continue to be amazed at the masses of people who truly believe they (and their children) are eating healthy food, because they’re buying the label hype. Meaningless terms like “healthy,” “natural,” “low-fat” — I think they contribute to this delusion and do more harm than good. Healthy is not making sure your child only drinks diet soda! By the way, I love the simple recipe; I have some brown rice penne in my kitchen right now that’s calling out for Swiss chard! Ha! that was actually brown rice penne in the photo. “…a corresponding 1.67-point fall in IQ.” That’s scary, Tammy. Glad you brought this to the surface. I am often heartsick over what is written on packaging. It is so confusing to the public. I think the USA is doing a better job than Canada in some of it’s labeling, but when the language is full of scientific jargon or is simply over-used, misleading information, it is profoundly discouraging. Let’s aim for a collective conscience about communicating simply and positively – with a view towards its power to affect society. I think the secret is to keep it very simple and close to the food source. I like your thought regarding collective conscience. Ooooooo yum, Tammy and perfectly said. Food should be fun for children as well as adults. Last night I used russet mashed potato cakes mixed with finely chopped Kale and green onions and a small amt. of cheddar fried gently with a spray oil and topped with smoked salmon and horseradish cream sauce. The children loved it. I will try your idea next. That sounds really good Sally. Happy St. Pat’s day back to you. Great post. Both of our sons I gave birth to were nursed for a year before weaning themselves. I have done my best to include a wide avariety of foods in their diets, and encouraged healthy, nutritions food in appropriate portions. These routines “took” to a greater or lesser degree depending on which son, but they both have superior IQ’s (in the genious category). I don’t know if that’s because they were fed right, or just genes or luck! Our adopted son probably was not fed well, but he managed to educate himself quite well in that regard – he is also a genius – and he has emphasized excellent nutrition for his nephew, of whom he has care at times. The childs mother is completely lazy and unconcerned and feeds him junk. When Adam has him, he does so well – really flourishes, and we are hoping and praying that he can get full custody in some way, and soon! I will say, however, that when our first son was about 1-1/2 years old, I read Adele Davis’ book on nutrition and diet for children. Although I read the entire book, according to her, Josh was already “ruined” for life. Rather than take it overly to heart, I tossed the book and decided to go with my own instincts. I can only hope that my instincts were good; as far as I can tell, I guess they were. Excellent post, Tammy, and extremely important! Thank you! It sounds as though your instincts and your practices were wonderful. There is information showing that you can “catch a kid up”. One book I frequently cooked from (and still use memorized recipes) was “Diet for a Small Planet.” When I dabbled in a vegetarian lifestyle, it was my bible. I still don’t eat a lot of meat, but I do enjoy it occasionally, and love it! However, I really need to know where it came from, and how it was treated and with what food it was fed! Great book Paula! I read Adele Davis also. Most compelling, Tammy – and definitely attention grabbing, in a great way! Do you see similar issues in South Africa? Of course. I forwarded this to my very-well-informed daughter-in-law. One thing I want to bring up is the relatively high rate of gluten-intolerance (NOT a simple allergy). When my aging body’s immune system started reacting in a life-threatening way to gluten I learned a lot about celiac disease. I read somewhere that ~40% of Italian children are gluten-intolerant. Wow!!! All that lovely pasta! I just mean to say, pay attention. And feed your children well, as you recommend. Interesting Cris and I have a confession. The pasta in the photo is what I actually used for the dish. It is gluten-free rice pasta. I wonder what’s bringing all the intolerance on? And back to you Carol. I sometimes get frustrated by all the bombardments aimed at mothers/parents bout nutritional perfection. Probably because I’m scared I’ll panic if I ever have kids myself! I think it is bombardments and here in the US we have a totally ineffective food pyramid that it ultra-confusing. The rule is to keep food as close to the source as possible. I think nutrition is so critical for ALL of us, but especially for developing children. I actually feel HURT when I see a parent giving a kid soda/pop/whatever you call it where you live (pop here in Chicago). But on the positive side actively providing kids with food to help them optimally develop and maintain health – brilliant! Thanks, Tammy. You’re welcome. I’m preaching to the choir with this post and need to find a way to move it outside. Did you consider the fact that the parents may have a lower IQ and that is why they feed their children junk, and the children’s IQ was therefore lower in the first place? There isn’t any proof that junk lowers the IQ – the only way you could prove that is by conducting a study using identical twins which, of course, would be unethical. I’m playing devil’s advocate because I believe it is important to eat healthily. However, I don’t think one can say unequivocally that food affects IQ. The study uses data on children’s diet reported by parents in food-frequency questionnaires at 3, 4, 7 and 8.5 years of age. Dietary patterns were identified using principal-components analysis and scores computed at each age. IQ was assessed using the Wechsler Intelligence Scale for Children at 8.5 years. Data on a number of confounders were collected, and complete data were available for 3966 children. Results After adjustment, the ‘processed’ (high fat and sugar content) pattern of diet at 3 years of age was negatively associated with IQ assessed at 8.5 years of age—a 1 SD increase in dietary pattern score was associated with a 1.67 point decrease in IQ (95% CI −2.34 to −1.00; p<0.0001). The ‘health-conscious’ (salad, rice, pasta, fish, fruit) pattern at 8.5 years was positively associated with IQ: a 1 SD increase in pattern score led to a 1.20 point increase in IQ (95% CI 0.52 to 1.88; p=0.001). Our food and our connection to the earth certainly presents itself in different ways. I’m learning so much here Tammy. Thank you. Do you think it’s never too late to start changing one’s ways? My family . . .they are so used to what they have had all these years. But I feel I am doing them such a disservice to not learn and try to do better! argh. If you take a look at the link, it does appear that it is reversible. Baby steps. Sneak things in on them here and there. It’s worth it. excellent post – my son has been eating whole and nutritious foods for his entire 12 years now and it does show in his school performance…. It really does make a difference. Thanks for stopping over. Very interesting blog, one both of my sons would agree with. Thank you. We have tried so many kinds of pasta meals, with different sauces based on veges, fish, cheese, chicken. Always a success and asking for more. I have this great book “Brain Food” giving information about food destined to all from kids to elderly people whose memory is getting slow. I must have a closer look at my bookshelves. oooh I didn’t look for a book like that but it sounds so interesting. I am especially interested in the topic around elderly also. Thanks Isa. I dig your sense of humor and your style. Such a brilliant article; so well knit with words and information. well, from a kid’s POV, it totally sounds like well informed moms force feeding spinach and beetroot though 🙂 I’m only kidding. I am sharing your link in my blog, if you dont mind. Love your blog. Thanks Rukmini. I’d be honored – a bit tickled that you find it so funny. Great comments, and I was very pleased to see the breakdown on the statistical analysis. It is likely no more than an interesting artifact, and a marker worthy of much study, but the point, just like global warming awareness is that it doesn’t matter whether it’s a true threat, it JUST MAKES SENSE! Why lay waste and destory when there are wonderful, life-extending, creation-protecting, good stewardship, and healing alternatives? Why feed your children or yourself junk when there is so much good and equally tasty food out there that is more than empty calories? I remember something my Mom used to make that we all loved. She would boil or bake potatoes and carrots together until they were both soft, then mash them together. It added to the nutritive value of both, and if your kids don’t like carrots, they are virtually tasteless in the mix. I’ve done the same for my kids, but also using sweet potatoes occasionally, – then they are also invisible. Works with turnips, rutabaga, and parships as well. Fortunately, my kids learned to love carrots, but never raw – they prefer them cooked, but I try to steam them and cook just to al dente. . .
We have to find strategies to make it easier. Inevitably, it will help our kids too. Wonderful to hear that all our hard work of preparing homemade meals has a benefit that we’ll not necessarily see outright. As mentioned above, I am also concerned in the increase of wheat and peanut allergies. Perhaps another post as to why this may be? I’ll put it on the list for a future post but it will definitely require some research on my part. We’re blessed not to have any of those allergies in our house but I definitely see them at school. Great and informative post Tammy. We are a curly kale and salmon family. I’m concerned how the radiation from Japan will impact the world environment and grown foods in particular. If you remember a few months back greens from Wholefoods were found to be imported from China. I’m really concerned about buying anything that isn’t grown locally. With winter still upon us in Balto it’s slim pickings. I was actually going to do a post about the foods that Wholefoods is importing from China. Thank you for posting this, Tammy! Good nutrition is so, so important! I didn’t know about the evidence you wrote about, but it doesn’t surprise me at all that a diet high in processed foods (especially sugar and unhealthy fats) is detrimental to brain development. Lucky me, my mom used to make all the food herself when I was little. She used to cook vegetables like carrots, potatoes, beets, rutabaga, and the like, and mashed them and fed it to me. I almost never got ready baby food from a jar. You’re about the third person to mention that. In reality, I did make it with gluten free pasta. I wonder if it’s too late for the brain development of us ‘previously grain-fed’ folks. I feel your frustration in your words. If you take a look at the article, there is some hope for the previously grain-fed but really the brain is growing so rapidly at a young age, that it’s critical. Progress sometimes takes a while. It is terrifying to see how many children are fed on dead food… I find it criminal that some people don’t feed their own children correctly. That pasty dish is perfect! It is unfortunate that many people do not know what is healthy. the brain-food approach is Very Compelling. is presented as Easy and Inexpensive, or cost-saving. Too often, people believe that cooking “close to the source” as you rightly say is difficult, time-consuming, and costly. But we know that real food is not as really as expensive as processed-packaged stuff. And, there are simple delicious things that can be easily whipped up..
we need to find ways to show people How-To-Do-It. Yes, we need to present it easy and inexpensive with tremendous benefit. I agree with you – now I’ve just got to fashion a project that will pull some of these ideas together. Childrens nutrition is being severely overlooked these days. On a related note….I heard in the news this week that most American babies’ first grain they are fed is a processed one (no surprise there). Studies are now suggesting to have whole grains introduced to babies first, and in return they will more likely prefer the whole grains over processed ones as they grow older. I am pretty sure that it was the case for my kids even though they escaped food allergies. Great information for new moms. Love Switch, and just read Enchant by Guy Kawasaki, along the same lines. Great read and to me it only makes sense that theres a connection between cognitive development and good nutrition. Now they are finding links between food dyes and behavior. Great post. The more I learn, the more I can’t believe that our society has made the shift to primarily eating such garbage. I also read an article recently about the link between hot dogs and childhood cancer. Your recipe sounds delicious! Bring on the brain food. Yuck, I haven’t heard about the hot dog cancer connection but should’ve mentioned it on my post tonight!! I was a big-time breastfeeder also. Now, two of my three kids are amazingly healthy eaters. The third wants to be.